The Atlanta Entertainment Basketball League (​AEBL​)​, We Got This Ent. and Streetz 94.5 are partnering in a community service effort to help Atlanta’s underprivileged youth and families this holiday season. 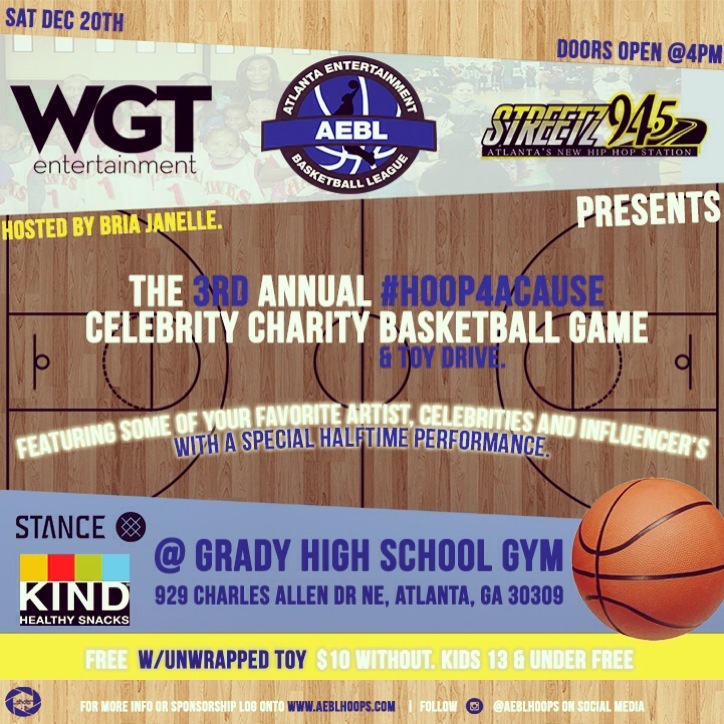 The 3rd Annual Hoop 4 a Cause event will take place on Dec. 20, 2014 from 4PM – 7PM at Downtown Grady High School Gym, located at 929 Charles Allen Drive Northeast, Atlanta, GA 30309. The Hoop 4 a Cause charity event will empower over 200 of Atlanta’s youth by providing toys, clothing/shoes and supplies. Attendees will be treated to live entertainment, fun contests, prizes and special appearances throughout the event by some of ​Atlanta’s ​favorite celebrities​. Participating celebrity players will include Trinidad James, Sy Ari Da Kid, Roscoe Dash, International DJ Benny Demus, internet star Bdotadot, DJ Geronimo and many others. The event is open to the community and donations for the event are being accepted this week at www.gofundme.com/hoop4acause. Other donations are welcome at the event site, the day of. The 3rd Annual Hoop 4 a Cause game is sponsored by Kind Snacks, Stance socks, Red Bull and FILA.